If you have incorporated the lessons from this course so far you have taken a number of steps that will bring you in closer rapport with your Higher Self. The most important ingredient is to recognize truth when it stares you in the face. This sense of correct perception is only developed by one with a sincere heart. This is why we wrapped up the lessons with the 24 Principles of Discovery. These principles are designed to be used by all. No extra sensory perception or mystical skills are needed. All the seeker has to do is use his common sense and an honest approach to apply them. Some of the other exercises take significant effort and spiritual sensitivity, but these just require an effort all can make. Once one has the basics of discovery down then he has taken a giant step toward soul contact for the soul lives in a realm where truth prevails and truth attracts truth. To attract the attention of your soul you must love the truth and seek to find it. If, then, you ever feel out of sync with your Higher Self go back and review the Principles of discovery. They will set you in the right direction so you can take the greater steps provided in this course and to you through your own soul. The course will finish with a year’s worth of lessons providing additional seed thoughts for your contemplation. These will be followed by several questions that are designed to cause your mind to reach out to your soul for understanding. The practice of contemplating seed thoughts is one of the best ways for the seeker to strengthen the link between himself and his soul. Energy follows thought and if you daily apply thought on a seed thought to increase understanding you cannot help but strengthen the link between yourself and your soul. The lessons on seed thoughts were on Days 74-76. It may be helpful to review them. (1) How and why do words veil truth? (3) How do you see beyond the veil to see the truth behind the words spoken or written? (4) How do you know when your words are understood? I’ll just make a few comments on yesterday’s seed thought. The understanding that words veil truth is very important because it opens the door to greater understanding. Those who have not opened this door like to see words as black and white in meaning, only conforming to their definition. Yet everyone uses words a little differently and to understand an author one must get a feel of his thinking so you can interpret him as he intends, not as you think the meaning should be. The words of Jesus were about as simple and plain as word could be yet they are interpreted hundreds of different ways by the thousands of sects. The common phrase we are looking for here is, “reading between the lines.” This refers to an intuitive perception that the wise reader must gain, for it is impossible for an author to give all the possible details in a script. If he even tried to do this the work would bore readers to death. I have written many short seed thoughts for my readers consisting of just a sentence or two. To make it quotable it cannot be long, so much has to be unsaid. Consequently, the reader must do so reading between the lines and see the point that is being made. Here is the one I wrote today which will also be the seed thought. As I expected some readers missed the point and stated that we learn a lot from failure. What do you suppose I really meant here and what do you suppose a failed life is? Then, on the other hand, what would constitute a successful life? Of course, there are lessons to be learned by examining any life and within each life are learning points. Most would consider dictators like Hitler, Stalin or Mao failed lives for none of these advanced soul purpose. These men and others used their talents to advance a material agenda leading to reduced freedom of the human spirit. They may have learned certain individual lessons but they failed to be of spiritual service to humanity. Even though these men were on the side of failed spirituality they did have interesting lives. Hitler, perhaps the greatest villain of all time, has fascinated historians and other writers since his emergence. One failed life does not equate to all effected by him being failures also, Because of Hitler and World War II many lessons were learned and hopefully the errors will not be repeated. A suicide represents another failure and any person committing this act in his prime of life will be disappointed in himself when arriving at his life review. Most failures in life are caused by either bad decisions or just plain inertia and lack of will to move forward. “There is nothing too good to be true. (1) How would a black and white literalist miss the truth behind this thought? (2) What is the real truth behind the words? The contrarian can find a reason to object to anything positive as it is much easier to take the negative route than the positive. In doing this though he will often miss the core meaning that is being presented whereas most seekers will get the general idea behind the thought which is this: All things which are good and desirable can be achieved or acquired. Of course, this will not happen instantly but can over a period of time. You may not become the richest person in the world, but can have all the things that make life worthwhile that this person may have. Follow the highest you know in darkness and in light. Soon your next step will be revealed to you. (1) How is this direction different than advice given by the preachers of the world? (2) What if the highest you know is wrong? (3) When are you most tempted to not follow the highest you know? (4) Why does following the highest you know lead to revelation? This thought runs contrary to that demanded by the preachers of the world. They basically do not trust their followers to go by their own inner light and follow the highest they know. Instead they merely demand that they follow God and what that turns out to be is the highest the preacher knows. Sometimes the highest the seeker knows is wrong, but if he or she is honest in heart then he will discover his error, correct it and get settled on the strait and narrow path to truth. Thus by following the highest one knows turns out to produce valuable lessons. The greatest temptation to neglect the highest one knows comes when an outer voice attempts to become the seeker’s greatest authority. When an authoritative outer voice demands to be followed suffer dire consequences then the seeker is often tempted to follow that rather than follow the proven inner voice which indeed represents the highest the seeker knows. The highest the seeker knows comes from that which is received and formulated within his own being and if he follows this above the clamoring voices without then the communication lines to the soul become strengthened which leads to insights and then revelation or unlimited knowledge. When the extreme seems normal the one who has balance seems to be the extreme. (1) Are there things that are called extreme today that were considered normal a few years ago and are there others that were seen as extreme a few years ago that are normal and acceptable today? (2) Are you one who is balanced in the middle or on an extreme? (3) Why is one who is balanced in the middle seen as an extremist by many? (4) How does one find the middle point of maximum truth? A lot of truth can be revealed when contemplating this thought. Indeed, there are many things that are called extreme today that were considered normal a few years ago and there are others that were seen as extreme a few years ago that are normal and acceptable today? For instance in the nineteenth century there were many practices and beliefs that were common that would be considered extreme today. There were Bibles and prayer in all the schools and many public buildings. Public buildings were often used for church services. Those people would have considered our idea of the separation of church and state extreme as does the present generation look upon their interpretation. In our past public hanging and dueling to the death was the norm but today that would be viewed as extreme action. Anything other than heterosexual identities was considered extreme perversion, whereas today the alternative people are widely accepted and those who maintain the old views are seen as extreme. From 1917 to 1965 the United States had restrictive immigration laws that people of today would declare to be extreme and racist, but the people of that time would see us as the extremists. People’s views change like a pendulum moving back and forth over a reasonable center. The question the seeker must ask is how close he is to the midway point of balance. Most people have difficulty in accessing this objectively as most extremists think it is the other guy who is extreme, and not himself. The strange thing for the one who does manage to balance himself between the two extremes is that he will often be accused of being extreme by both sides. The reason for this is simple. Most people view themselves as being normal and those who differ as the extreme. Finding the point of balance in the center takes an open mind willing to study both sides of an issue and then use good judgment to pick a position. The true seeker will access the soul in doing this. The fact that we exist, or that God or anything exists, is the greatest miracle of all, and boggles the mind of the highest initiate. We look at the world around us and marvel at the unseen hand behind the beautiful planet, the flowers and the teeming life, but often overlooked is the greatest miracle of all which is that anything exists at all. Contemplate this thought and see where it takes you. Seekers appreciate seeing the intelligence of God manifest in the creation of all life with its beauty and great complexity. This is especially revealed in modern research into DNA, which turns out to be more complex than anything we can copy or duplicate at this time. The complexity of life on the microcosmic scale has convinced some open minded scientists that a great intelligence is at work. Scientists also came upon a great mystery when they discovered the universe is expanding. They reverse engineered the expansion and came to the conclusion that the whole universe was once contained in a single point smaller than an atom. That point, they call a singularity, exploded in what is now called the Big Bang and from that incident came all there is. Where this point of condensed essence came from or what caused the explosion they do not know. Unfortunately, most scientists do not want to consider that Divine Intelligence had anything to do with it. Science and philosophers are happy to look at the effects of existence, but ignore the greater question which is this. Why does anything exist? Many think it is a fanciful thought that God in some form could be real, but is it not just as amazing that anything exists at all? If at one point there was nothing, not even God, then how could there be something at another point? I will share the results of my contemplation on this. The one thing that is eternal is the principle of cause and effect. This principle has always been and the interplay produces intelligence, which is also eternal. Cause and effect directed by intelligence has created all there is including the manifestation of all life, Divine and otherwise, in the universe. In the end, love is One, but in its discovery it is many. Contemplate the meaning of love and the truth contained in this statement. Many spiritual teachings emphasize the oneness of God and all life for God is seen as the embodiment of all there is. This is a little like the idea that the human body contains around 37 trillion cells, each having a life of their own yet form a greater life which is you. You are one life, yet represent many lives. Another example of oneness is found in the example of the ocean. Each drop of water in the ocean identifies with the whole. It is not until the drop of water is separated from the ocean that it is seen as a separate thing. Then when the drop is placed back in the ocean it again becomes one with the ocean. We are more like a cell in the body of God than a drop in the ocean, for the drop loses its identity when merged but the cell maintains a separate life while being one with the body. In this reality we have left our Source and are gaining experience through the illusion of separateness. To get back home each of us must discover love. Love is that great force which draws all creation back to its center. To get back to that oneness of being requires the seeker to experience love one individual at a time at first. After he or she learns from many people, one at a time, the seeker will eventually move on to embrace all life and share a oneness on higher levels. Love is thus discovered through many individuals, but reaches its apex in oneness. None of us want disease and pain, but disease and pain are often caused by what we want. How is it that our wants and desires often cause us problems and how do conflicting wants amplify our problems? The problem with our desires is that we have a lot of them and they conflict with each other. For instance, a lot of people want to be rich, but generally material success requires the investment of a lot of time and energy on the goal. Many successful people have had to sacrifice numerous things they desired to attain it. Here are some desires that many find to be in conflict with the desire to be rich. (1) Spending more time with family. In other words, there are many desires most of us have that that keep us from being as wealthy as we may desire. Most desire more wealth, but they desire other things more. The desire that is strongest in the mind at the present will win out. If your kid has a ball game at the same time you could be making a business deal and you go to the ball game it doesn’t mean that you didn’t desire to make a successful deal, but it does mean that you desired to support your kid more than you desired the financial gain. The strongest desire will always win out. Now let us apply this principle to the seed thought. Everyone desires good health and the desire for good health is pretty powerful. You would think that we would not let any other desire take prominence over this, but unfortunately we do. Good health requires us to eat nutritious food but we often desire junk food and yield to them because we like the taste or like how they make us feel at the moment. Because the negative effect on our health is not immediate many let their desire for harmful foods take prominence over health. Exercise is also essential for health and we often let the desire to do other things take precedence over the desire for adequate exercise. Knowledge of what creates good health is essential yet most would rather see a good movie than read a health related book. Yes, we all want good health, but there are many other desires competing for our attention that will take us away from the goal. The solution to the problem is simple yet difficult. The seeker must use the power of will to control and direct desire so the important desires dominate. If a teaching seems to make no sense do not trust it until it does make sense. Do you know people who believe things that make no sense? Why do they follow something that is not logical? Now search your own beliefs. Can you logically explain them all? Why not? This seems like a logical and obvious truth yet if people search their belief systems they will usually find a number of beliefs that they accept that make no sense. Here are just a few common ones. (1) Catholics believe that when they take the Eucharist that it is transformed into the literal flesh and blood of Jesus. When you stop and think about this it indeed makes no sense and I’m sure many good Catholics doubt that it is true. (2) Many who believe in a literal physical resurrection reject cremation because they think the elements that composed their body will be needed to bring them back to life. On the other hand, the body is completely renewed with new elements every fourteen years so even nature does not require you to keep possession of the elements of your body. In addition many humans in past ages have died and become fertilizer for plants that have been part of other human bodies. The universe was created in six 24-hour days. The earth is no more than 10,000 years old. The earth is flat and surrounded by a dome. (4) Conspiracy theories. To deny the existence of conspiracies is not logical, but to see a conspiracy under every rock is even more illogical. Every major event has conspiracies associated with it and many of them do not make a lot of sense. Most real conspiracies involve a small number of people and usually involve taking someone out. Then within days of writing this, conspiracy theories popped up along this same idea. Not every big event has a conspiracy behind it but most have anomalies that could provide fodder to drive conspiracy thinking. Sooner or later the seeker will find that all things that are in harmony with his or her soul will be logical and make sense to the reasoning mind. If your Higher Self has not revealed the truth of a teaching to you then the safest course is to not accept it until it makes sense. Evil is that which pulls us backward in evolution and good is that which pushes us forward. Think of at least three questions you can ask yourself about this thought as you contemplate it. This seed thought directs the mind toward a different idea of what good and evil is than is presented by the orthodox view. And what is the orthodox view? The standard idea is often presented somewhat nebulously with statements such as. “Good is being on God’s side.” But who defines what that is? “Good is obeying the commandments and following scripture.” But many have different ideas of how to do this. “Good is to support your church and its leaders.” But what if they are in error? Then evil is the opposite of the above and particularly applies to those who follow the tricky devil. The problem with the standard idea of good and evil is that all of us can be classified as good or evil by someone’s definition of the term. This new seed thought cuts through the illusion and defines good or evil by direction. If you are headed in the direction of spiritual progress you are following the forces of good, even though you may make a few mistakes or have some beliefs that would classify you as evil in the mind of the fundamentalist. On the other hand, if you are not applying yourself and retrogressing in spiritual progress you are on the path of evil even though you may have as squeaky clean image and be quite pious. It is advisable for the seeker to reflect often on this though and ask himself regularly the question: “Am I moving forward or backward?” The path forward always takes us toward greater freedom and removal of limitations. The path backward restricts our freedoms and increases limitations. The true glory of accomplishment is in initiation, not imitation. Finding three questions around this thought should be no problem. It is the natural tendency of us humans to want the rules laid out for us. We want to go from A to B to C and achieve D. We are willing to work hard if the path is clear and all we have to do is follow it. Instead of going where no man has gone before the inclination is to follow in others footsteps and achieve as they have achieved. Now there is nothing wrong with learning from others and following a path to achievement that others have paved. We have all done this to a degree. A certain amount of this process is essential to everyone’s leaning. However, there comes a time in the life of the seeker where he must take the path less traveled by and forge some new ground on his own. Instead of just copying what others have done he or she will be impressed to do something original. I was just watching he mini series about Picasso and noted how he had to rebel against family and teachers to forge his own path. He didn’t want to just be a good artist in the orthodox sense, but wanted to do something new and different in the trade. Now we cannot all be a Picasso, but all seekers can find something to support that is not just a carbon copy of what has been done before. It can be something that applies to the individual’s life or support of some group endeavor to initiate the good, the beautiful and the true. To initiate something new requires something more than following rules or connecting the dots. It requires original thinking, that for many is a greater effort than hard labor on a sure thing. To move forward with initiating requires creative thinking and risk, and many would rather take any alternative than take a risk. The difference between the two paths may be illustrated by two people attempting to create a work of art. The first guy is doing a paint-by-numbers picture. When finished his paining looks very nice, but a thousand other people have done the same thing and gotten the same results. The second guy wants to paint a unique picture. First, he has to study the art and then paint in a unique and creative way. When finished he has a painting unlike any other – one that has the possibility of having a high value. Sooner or later the seeker tires of painting by numbers and wants to initiate by the light of his soul. Be still, reach into the silent place, and know who you are. How do you become still? What is the silent place? Who or what are you? One of the prime obstructions to soul contact is a lack of stillness. There is always a lot of movement going on in the three worlds of human endeavor – composed of the physical, the emotional and the mental. To obtain soul contact the seeker must still the outer voices that tempt him to shift attention away from the point of stillness within that must be accessed. On the physical plane we have television, the internet, social media, family members and friends wanting attention as well as numerous interesting things to do that either delay or take us away from the point of stillness. To test the advantage of stillness, just sit in a chair and remain perfectly still for three minutes. You’ll notice that this simple act by itself will have a calming effect. Perhaps the greatest tempter of the consciousness away from stillness is the emotional self. We have all kinds of emotions, good and bad, that easily capture the attention of many and make it extremely difficult to find that silent place. Just imagine that you worked for three hours creating a file on your computer and you trashed it by accident. Most would be quite upset by this and would have difficulty in stilling the emotional self shortly thereafter and finding the silent place. Yet this is what the seeker must do. He must learn to override the emotional distractions, still the outward emotional noise and focus within. Realistically few can expect to still the emotional body right after an upset, but when properly focused he should be able to do this within a few minutes. There is an excellent line from the Course in Miracles which says, “I am not upset for the reason I think.” Searching for the true reason behind the upset can aid the seeker in calming himself. The third distraction is the mind. The seeker cannot find the point of stillness if the mind is racing with all kinds of thoughts that have little to do with the spiritual quest. Yet when linked with consciousness the mind can be a great friend to the seeker aiding him to focus within where the fountain of wisdom can be found. When the seeker stills all, in the three planes of human activity, he will then open up the silence within to consciousness, the point of contact for the soul. This is an interesting and somewhat paradoxical thought. See what you can do with it. In a nutshell the principle implied is this. The higher we ascend and the closer we get to our Source the more the oneness of all things is realized. There is one great life that permeates the universe of which we all are a part. We as part of that life participate in wholeness. Creation came from One that multiplied Itself into the many. Even though we seem to be many different individuals we are still merely an extension of the one. Therefore, one plus one, or you and me, are part of the one Source and one Life. In the end we equal one. Perhaps the best earthly example of the oneness of life is our body, which is composed of trillions of cells with individual lives but as a whole the body is one life which represents you. Even so, all life in the universe composes the body of God, or the One Great Life. The task of the seeker is to live in this world of the many differentiations while realizing oneness through higher conscious ness. Truth is spiritual wherever it is found. There is no such thing as spirituality without truth. Is even truth about negative things spiritual? Are there those who put themselves forward as spiritual that do not represent truth? Go ahead. Ask more questions. Maybe the first question to ask here is exactly what qualities must a thing have to be spiritual? When you think about it there is nothing more important than truth. Finding the truth no matter what it is takes is a step toward another truth and in the direction of Spirit. 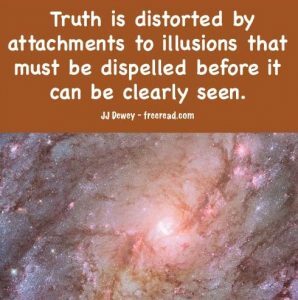 A lie clouds the picture, makes it difficult to see things as they are, hinders the discovery of more truth and takes us away from Spirit. Some figure that there are times it is better to lie than to tell the truth. Let us say a guy has an affair, but his wife is suspicious and asks and he insists that her imagination is just going wild. He figures he is saving her some hurt by lying to her. Yes, sometimes the truth hurts, but the hurt is amplified when the truth reveals not only a traitorous act, but lies to conceal them. Even if betrayal is concealed the one betrayed still senses the truth on subtle levels and this diminishes the relationship. Overall, if the seeker is centered in the truth, even in difficult situations, he or she is centered in the Spirit for the Higher Self knows only truth and cannot be deceived by its reflection. Unfortunately, there are those who put themselves forward as spiritual teachers who are not centered on truth, some of them willing to blatantly lie to get followers. Because like attracts like the deceived will gather to themselves others who are deceived and love not the truth. The job of the seeker is to find the truth wherever it lies, To find it he must first develop a love for the truth and plan his life so he will not be tempted to lie and deceive. If he loves the truth, he will find the truth and become the truth through finding and merging with his own soul. True freedom is not imposing your will on others so you can have what you want. It is creating maximum freedom for all, often at the dismay of those in power. Think of examples where people are willing to take away the freedom of others so they can have what they want. There are two ways to define freedom. The first is to see it only in terms of you, the individual. The second is in terms of maximum freedom for the whole. In the first case a few individuals may get maximum benefit, but it may be at the expense of many who suffer loss of freedom. In the second case all will have freedom of opportunity within the rules of a civil society but some will still complain they do not get all they want. No society can provide enough freedom to satisfy 100% of the citizens. The best that can be hoped for is maximum freedom for all within the group. Some think that an anarchy would provide maximum freedom but in this they greatly error. Anarchy would produce great suffering for the majority which would lead to tyranny. The most significant example of the first case is the Old South before the Civil War. They maintained that they needed slaves to be free and when they fought the North because of slavery they maintained they were fighting for freedom. One of those supposed freedoms was the freedom to have slaves. Yes, the ownership of slaves did provide a little more freedom to a few in the upper class, but it drastically reduced the freedom for the whole which is the goal that should be pursued by the seeker. The problem of putting the freedom of the individual or class over the freedom of the whole persists today. This is most obvious when it comes to taxing citizens and the government borrowing money for different causes. There are many groups willing to tax people more than they are willing to pay and borrow additional money from the Federeal Reserve to benefit a few while the whole marches toward less freedom. There are many who support unnecessary and restrictive laws that will cause the majority to have less freedom. Freedom is seen by many as undesirable because in a state of maximum freedom there will still be some crime and problems. The seeker must ask this. Which nation on the planet seems to have the lest problems with crime and rebellions citizens? North Korea would be at the top of the list. There you never have a school shooting or hear of a bank robbery. But would any U.S. citizen want to live there? Because it is a living hell. Common people eat tree bark, grass and even dirt to survive. Freedom requires reasonable enforcement of law and order so the many can have a pleasant life, but a happy medium must be reached so the majority are happy with the freedoms they have. Light dispels darkness but darkness cannot dispel light. Even so, truth, revealed and understood, obliterates that which is false. There are many questions that can be asked about this thought. For instance, if this is true them why does it take so long for some truths to be accepted? See if you can think of more questions – and their answers. The first question the seeker would want to ask is why this is true? Why is it that light can dispel darkness but darkness cannot obliterate light? In other words, you can shine a flashlight in the dark and instantly reveal that which was hidden in the darkness, but there is no darkness beam you can project to hide that which is revealed by light. The reason for this is that light is something and darkness is nothing. You can project light because it is made of something, which science says are photons, but you cannot project that which is no-thing. When something is revealed the illusion of nothing no longer exists. I didn’t realize what real darkness was until I visited Carlsbad Caverns in New Mexico. There the guide took us into a cavern and turned out all the lights. The absolute darkness was amazing. I thought I had been in the dark before, but this made me realize that I had not. Then when he turned on the light the darkness instantly vanished and I could see all the beauty of the caverns. Light is the foundation of all creation and its wavelengths in their varying degrees create all the visible universe. Thus is creation produced by the real, but separated by the unreal. When the real is brought to our consciousness the unreal that hides it no longer has effect. The real represents truth and darkness is that which hides the truth. When the truth is no longer hidden it shines forth for all to see. Why then does it take so long for some truths to be seen by all? Let us suppose there are 100 people placed in a large dark room and they are told that somewhere in this room is a real gold coin, but in other locations are 99 false coins. The false coins have a somewhat gold color, but are not true gold. Each person is given a small penlight with which to search. All those who acknowledge the true coin will receive one. After a lot of searching many think they have found the true coin. Jim found the true coin first, but kept the information to himself. After a time some realized the coin they found was not real for it did not have the right color or weight as true gold. Finally, a couple who did find the true coin started proclaiming it. Someone noted that if several combined their little lights into one light and shined it on the true coin that the true color of the gold would become obvious. After a time the whole group gathered together and combined their lights and shined them on the true and false coins. After this happened the whole group realized which one was the true coin. A book could be written on this thought alone, but at this point we’ll leave the rest for the seeker to contemplate. Words and other forms of earthly communication veil truth, even if they come from God. Wouldn’t a communication from a Divine Source be so clear that there would be no misunderstanding? Explain. Perhaps the most universally accepted words as being seen as coming from God are the Ten Commandments. Yet even with these ten injunctions the interpretations vary quite widely. There are some that think this should apply not just to humans but also to animals. Others criticize the believers because the ancient Israelites supported the death penalty for numerous crimes. In addition, they went to war with God’s approval and killed many of their enemies. Supporters explain that God meant we should not murder as in what we call the first degree. Whatever the case the words from God hide the real truth from many. This commandment caused numerous attacks on Jesus by the authorities. When they read that one is not supposed to do any work on the Sabbath they literally interpreted that to mean “any” and they accused Jesus of breaking the commandment by working at healing on that day. The Jews at the time of Jesus had hundreds of rules that defined what constituted work. For instance, you were told you could take so many steps and beyond that number you were working and breaking the commandment. Believers cannot even agree on the day for the Sabbath. Many believe it has to be Saturday whiles others say Sunday is fine. Then many Muslims consider Friday as a day of rest. This only tells us that the real truth behind the Sabbath is hidden from most who read the words. The truth is this. No matter how clearly an author tries to place thoughts into words some will not interpret the meaning as intended. The reason is that human words are an imperfect means of communication. The seeker must always look for the full truth hidden between the lines and this will only be seen when a measure of soul contact is achieved. Without soul contact the person will interpret only in terms of black and white and often miss the mark. With soul contact the seeker will get a sense of what the author was trying to convey and will often see the principle behind the message. When the principle is seen the reader will not only get the true intent but often will see more truth than was written. Once the seeker reaches that point where he is totally dedicated to following the highest he knows, then illusion must be dispelled or he will become dangerous. On the other hand, what if the guy is sincere, tries to be a good follower, but has some wrong-headed ideas that would harm others? That cannot be good. It is a common belief among the spiritually inclined that the end of the spiritual quest is reaching a point where one has taken in all the good teachings in the scriptures and other good works and follows them to the best of his or her ability. There are all kinds of ideas as to where the endpoint is ranging from merely accepting Jesus as Lord, to performing good works to the end, to having your calling and election made sure through a personal revelation. The truth is that progression is an endless path. Could you imagine reaching a point where there were no other challenges to face or new goals to pursue? When you think about it this would be hell as eternal boredom would follow. Yes, reaching a point where the seeker is doing his best to live the good life is a good accomplishment, but it is just a step. Little understood is that the next hurdle has dangerous illusions to overcome. This is the point where the seeker takes the path of darkness or light. If he inadvertently takes the path of darkness he can still backtrack for a period of time, but when he reaches a point where he realizes he is on the dark path and still continues then his path is set and no return becomes possible. There are many dangerous illusions that tempt good people. Here are a few. (1) “I have reached the end of the spiritual road and now I can relax.” The person thus ends his progression into the light and entropy pulls him backwards. (2) Children are born in sin and people are basically evil. This causes the person to focus on the dark rather than the light. (3) (A certain race or group) is a blight on civilization and needs to be destroyed. Many people of otherwise good intent are captured by this illusion and become dangerous. (4) It is better that my wife and children die than face the troubles we have. This thinking is voiced by numerous people, of otherwise good intent, who killed themselves and their family so save them from problems they faced. Once the seeker reaches that point where he follows the highest he knows his job is then to dispassionately examine his beliefs to make sure they are correct and that they will aid him in continuing on the path of light and truth. He who listens to the inner voice can find more truth in the National Enquirer than one who is in illusion can find in the Bible. Why do you suppose this is true? For many believers, the Bible is the gold standard for truth and the National Enquirer and other tabloids are right down at the bottom of the list. Yet even though the Bible contains many valuable truths the reader can be led astray on many things if he does not read by the light of the soul. One who is numb to the inner voice can read the most inspired writings and be deceived but one who is sensitive to it can read the most radical writings and not be deceived, but see the truth behind them. (1) Interprets literally in black and white. For instance, the Bible refers to the “four corners of the earth.” Some still claim that the earth is flat with four actual corners. Black and white interpretation will always yield many mistakes by the reader. (2) They interpret in the light of what authorities in their life have told them. For instance, if their authorities tell them that salvation consists of X, Y and Z then every individual interpretation will favor this. (3) The self-deceived will interpret in harmony with their lower desires. If they want a thing to be true then any words to the contrary will either be ignored or irrationally explained away. For instance, those who want the earth to be flat tell us that the many thousands of actual photos by numerous countries showing otherwise are fake. On the other hand, one who listens to the true inner voice is very difficult to deceive. He can read a tabloid claiming that the president met with aliens and see the probable truth with an open mind. Now the inner voice will not whisper the words, “No, the president did not meet with aliens!” Instead, it reveals principles which gives the whole picture. Such a seeker will know that there are indeed other life forms in the universe, yet the possibility of the event being true is extremely small. Obviously the tabloid is going for an attention-grabbing headline. The true seeker will be extremely accurate in understanding principles, which filters down to a high accuracy with facts, though no one is 100% accurate with black and white data. Every possibility is manifest somewhere and every possible experience that can be lived is being played out somewhere. You as an individual are going through an experience unique to yourself, slightly different from any other life in the Universe. There is a lot of food for thought here. Reflect and see where it takes you. With over seven billion people on the planet one can only imagine how many possibilities are playing out in human lives alone. It is staggering to think about. Some are in great pain, suffering from hunger, disease and depression. Others find great joy discovering the love of their life and meeting with great success. Some are free to do as they wish where others have their lives controlled beyond that which the free person even wants to consider. But when we consider the magnitude of the universe the possibilities are magnified exponentially. The earth resides in this solar system consisting of nine planets, plus five known dwarf planets, lots of moons, asteroids, comets and the sun itself. The earth is the only one with life as we know it, but there are many other possibilities of life upon and within the various spheres. Now, this solar system is only one of many within the Milky Way Galaxy. And what would that number be? Most scientists believe it to be over 250 billion. Just think. If only one in a million solar systems within the galaxy had intelligent life on its surface that would mean there would be 250,000,000 earthlike planets in this galaxy alone and I would suspect that this is a very conservative number. But, the Milky Way is only one galaxy out of many. How many? Astronomers can only calculate the number in the observable universe and the current estimate is two trillion galaxies of which the Milky Way with 250 billion solar systems is fairly average. Two trillion galaxies – that is 2,000,000,000,000, which is two thousand times a billon and if only one out of a million solar systems have an earthlike planet the number of earths would be 250 million times two trillion, a very large number indeed. These numbers only apply to that part of the universe we can observe through telescopes. Scientists can only guess at how many more stars and galaxies are in the rest of the universe. Is the universe ten times larger than we can observe, a thousand times or maybe infinite? Or could the universe with trillions of galaxies be only one of many similar universes? Whatever the case, the numbers are mind boggling and the probability is this. There are trillions of other intelligent life forms out there. Some will look like us and some will look very different from us. Spiritual students know that the One Great Life we call God permeates every other life in the universe which means that the life of God is experiencing every possibility that can be imagined. The variety of experiences on this earth alone are enormous, but beyond the imagination of humanity when considering the universe itself. That’s enough food for thought for now, but much more can be had by further contemplation on this seed thought. God needs all Its creations for Itself to be complete for the ALL is God, not the All minus one. Some will register this to be true and others will not – so why or why not is this a true statement? Links for the first 18 sections of this series.